Aloo Choliya | Choliya Aloo | Punjabi Aloo choliya | Fresh green chickpeas curry ,a rich curry from northern India, with authentic Punjabi flavors.A curry made with potatoes and fresh green chickpeas.This is a winter dish as in northern India fresh green peas are available in the market for a short time.Green chickpeas are freshly picked fresh from the vine.They are sold on the vine and also blanched and de-skinned in the market. It’s a regular feature at any north Indian or Punjabi household. Its preparation is similar to that of Aloo Matar / Potato and peas gravy. We first make a gravy base, add the potatoes and choliya and pressure cook till done. In case you do not have a pressure cooker or cook in a vessel or then pre-cook the fresh green chickpeas and then add them to the cooked gravy along with potatoes.You can even cook this dish in a Crock-pot. Make this recipe either in clarified butter/ Desi ghee or in mustard oil. 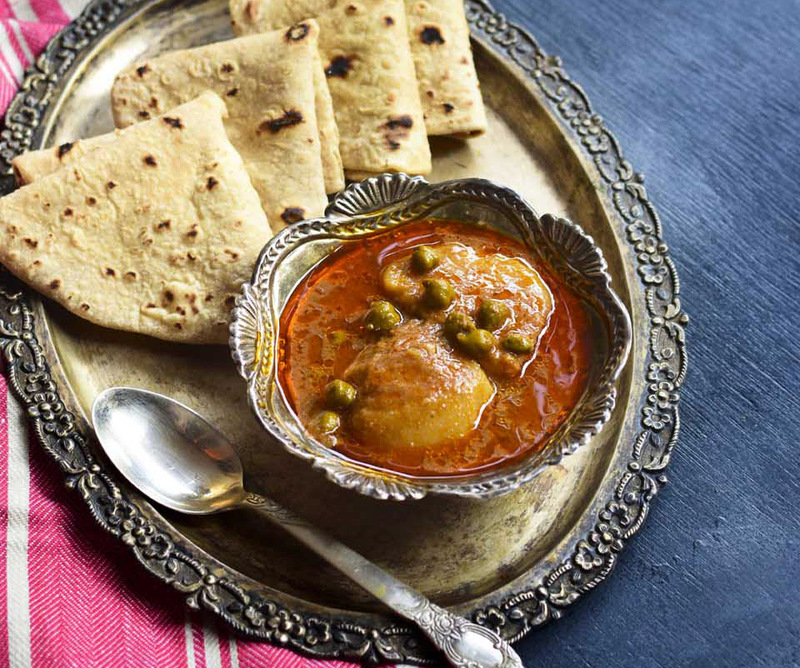 These do complete justice to the amazing flavors of this rich curry. You can substitute potatoes with Paneer or cottage cheese to. We make Aloo Choliya or choliya paneer and both come out delicious. In few Indian kitchens, even sun dried lentil dumplings / Wadiyan are also added. Then you get a spicy gravy with lovely flavors of the masala lentil dumpling.We too add it occasionally. This gravy is a spicy one but ,you may adjust the amount of chili to your taste.Also if you prefer more then add a red chili instead of degi mirch powder. A very healthy and nutritious curry dish. 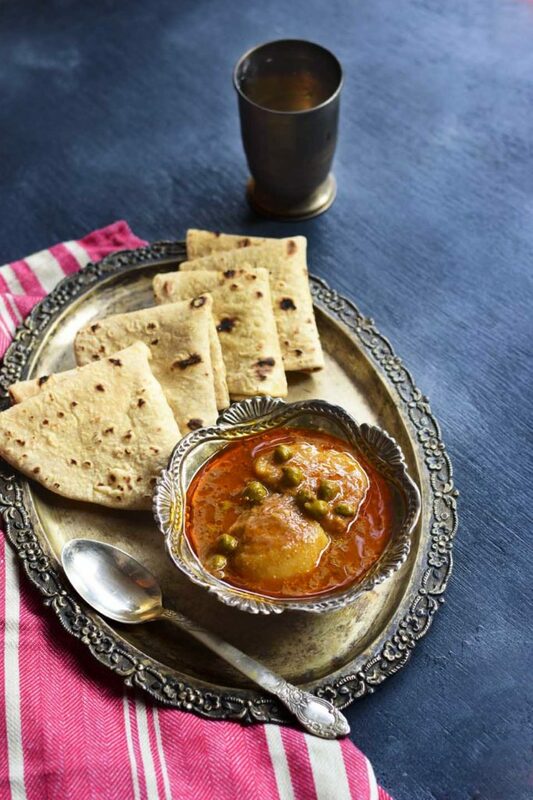 Aloo Choliya | Fresh green chickpeas curry ,a rich curry from northern India, with authentic Punjabi flavors.A curry made with potatoes and fresh green chickpeas. 3 potatoes each cut into 4-5 pieces. Heat ghee / mustard oil in the cooker. Add the black cardamom and cumin seeds and let it splutter. Add the onion paste and cook till light brown. Add a little water ( about 4-5 tbsp) and cook on simmer till oil separates. This will take just a few seconds. Add all the spices and salt. Add the pureed tomatoes and cook until oil separates. Please keep the flame medium high to cook evenly and avoid burning. When the oil separates , add the choliya /fresh green peas and potatoes.Mix well. Lett it cook for 5 minutes. Now, add the water and cover the lid and pressure cook it for 1 whistle on full flame and 2-3 whistles on simmer. Note: Store the fresh green chickpeas dipped in water and refrigerated till ready to cook. This will help it to not dry up and remain soft and cook faster.When ready to cook, drain the water and cook in the desired gravy. I have never had green chickpeas but I think Canadian Superstore has them! This Curry looks so appetizing that I’m really tempted to try it. Oh, you are making me hungry. I love chickpeas and potato curry and love that you made it tomato based. Such a pretty color. Now I want to cook Indian food for us soon. Been a while since I made Indian food. This is absolutely beautiful! I’ve never had it before, you’ve made it sound amazing! 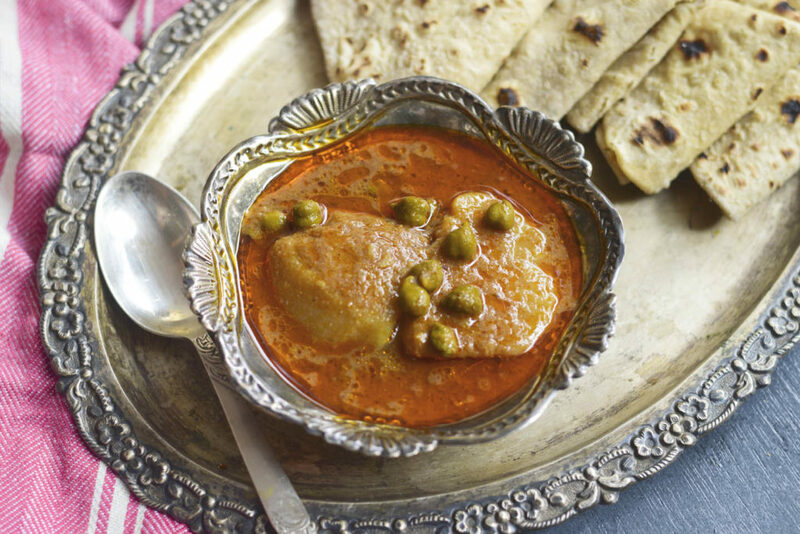 I’ve never heard of green chickpeas, but I love a good curry and this one looks really tasty! Lovely presentation and flavorful recipe. I am hungry looking at the curry. Yummmmy! This looks like my kind of meal!! I think I would make it in the crockpot! I haven’t tried green chickpeas but we do like spicy so this dish would be super popular at our house. I like the spices that you use in the curry — it would make such a great meal when it’s cold out. Warming us up from the inside out. Will be pinning the recipe so I can make it later. All of the flavors in this dish has my mouth watering. Perfect for dipping bread and savoring every bite. I love all of these flavors and have all the ingredients in the kitchen! I’m going to make it the next time we want a healthy appetizer or snack. It sounds delicious. This looks delicious! I’ve recently discovered chickpeas but I haven’t tried green chickpeas yet. I’ll definitely have to add this to our menu for this week.